Objective: To examine whether long term consumption of a probiotic milk could reduce gastrointestinal and respiratory infections in children in day care centres. Design: Randomised, double blind, placebo controlled study over seven months. Setting: 18 day care centres in Helsinki, Finland. Participants: 571 healthy children aged 1-6 years: 282 (mean (SD) age 4.6 (1.5) years) in the intervention group and 289 (mean (SD) age 4.4 (1.5) years) in the control group. Intervention: Milk with or without Lactobacillus GG. Average daily consumption of milk in both groups was 260 ml. Main outcome measures: Number of days with respiratory and gastrointestinal symptoms, absences from day care because of illness, respiratory tract infections diagnosed by a doctor, and course of antibiotics. 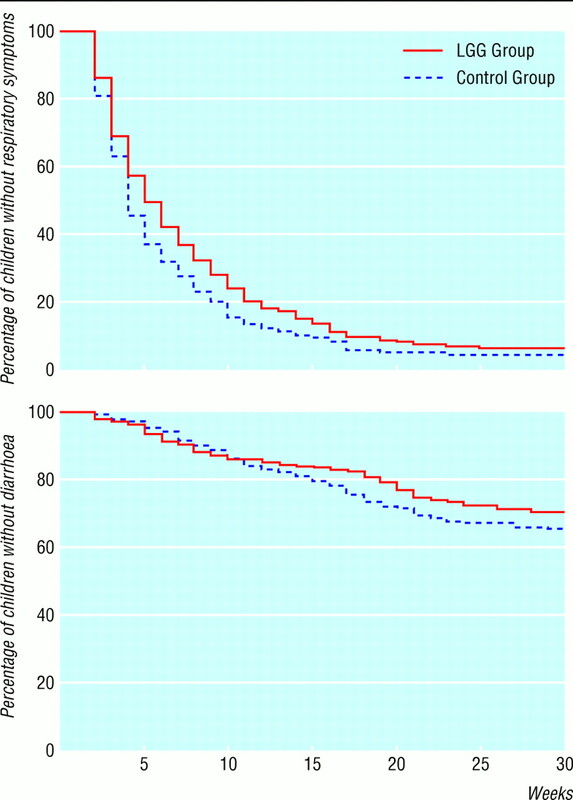 Results: Children in the Lactobacillus group had fewer days of absence from day care because of illness (4.9 (95% confidence interval 4.4 to 5.5) v 5.8 (5.3 to 6.4) days, 16% difference, P=0.03; age adjusted 5.1 (4.6 to 5.6) v 5.7 (5.2 to 6.3) days, 11% difference, P=0.09). There was also a relative reduction of 17% in the number of children suffering from respiratory infections with complications and lower respiratory tract infections (unadjusted absolute % reduction −8.6 (−17.2 to −0.1), P=0.05; age adjusted odds ratio 0.75 (0.52 to 1.09), P=0.13) and a 19% relative reduction in antibiotic treatments for respiratory infection (unadjusted absolute % reduction −9.6 (−18.2 to −1.0), P=0.03; adjusted odds ratio 0.72 (0.50 to 1.03), P=0.08) in the Lactobacillus group. Conclusions: Lactobacillus GG may reduce respiratory infections and their severity among children in day care. The effects of the probiotic Lactobacillus GG were modest but consistently in the same direction. Children attending day care centres have a 1.5-3.0 times higher risk of gastrointestinal and respiratory tract infections than children cared for at home or in small family care groups.1–6 Increased risk of disease has obvious public health and economic consequences, such as direct medical costs as well as the indirect costs of parents having to take time off work to look after sick children.7–9 Prevention of infections in day care is therefore of major importance. Probiotic bacteria, which beneficially affect the host by improving the intestinal microbial balance, may affect the immune response. Lactobacillus rhamnosus GG, ATCC 53103, a probiotic strain of human origin with widely documented health effects,10 influences immune response, both specifically by stimulating antibody production11 and non-specifically by enhancing the phagocytic activity of the blood leucocytes.12 It promotes recovery from rotavirus diarrhoea11 and reduces the incidence of diarrhoea associated with use of antibiotics in children. 13 14 However, most studies of probiotic bacteria have been short term trials. Over a seven month winter period we examined the effect of consumption of milk containing probiotic bacteria on the incidence of gastrointestinal and respiratory infections in children attending day care centres. This randomised, double blind, placebo controlled clinical study was carried out in 18 municipal day care centres, in similar socioeconomic areas in north, west, and north east Helsinki. Children aged 1-6 years were recruited through meetings with parents. We excluded children with allergy to cows' milk, lactose intolerance, severe food allergy, and other severe chronic diseases. All the healthy children whose parents gave informed consent were randomised for the trial (n=594). The study protocol was approved by the ethics committee of Helsinki City Health Department. The intervention lasted seven months over the winter. The Lactobacillus milk (Gefilus, Valio, Riihimäki, Finland) contained 1% fat and 5-10x105 colony forming units/ml of strain Lactobacillus rhamnosus GG (ATCC 53103). The control milk had the same composition but without Lactobacillus. Milk types were deliverd in cartons coloured yellow or green. The day care staff, parents, children, and investigators were unaware of which milk carton contained Lactobacillus until the intention to treat analysis was performed. The day care staff served the study milks three times a day, five days a week. Every day they reported the amount of milk consumed by each child. The aim was a daily consumption of 200 ml. We estimated compliance for milk consumption by calculating the percentage of days during which milk consumption was at least 200 ml. Mean compliance was 60% in both groups. Other products containing probiotic bacteria were forbidden. We calculated sample size on the assumption that the use of Lactobacillus GG would result in a 20% reduction in respiratory tract infections. Pönkä et al reported a mean (SD) of 3.3 (2.3) episodes of illnesses among day care children during an eight month follow up.17 We estimated that, with a power of 90% and at a significance level of 0.05, we needed 250 children per group to show a 20% difference between the groups. Each child was randomly allocated to the Lactobacillus or the control group according to a computer generated, blocked randomisation list. We used a block size of four, stratified according to age (<3 years and 3 years and over) and day care centre (18 centres). The primary outcome measures were the number of days with respiratory and gastrointestinal symptoms or days with any illness; absences from day care centre because of illness; number of children with upper respiratory tract infections with complications (acute otitis media and sinusitis) and lower respiratory tract infections (acute bronchitis and pneumonia) as diagnosed by a doctor; and antibiotic treatments during the seven month intervention. A secondary outcome was the correlation between the amount of milk consumed and the number of days with symptoms. We also defined a symptom score to measure the overall burden of symptoms (sum of all recorded symptoms, daily range 0 to 9). The distribution of the number of days of illness, days with respiratory and gastrointestinal symptoms, and the symptom scores and days of absence due to illness were skewed to the right and were logarithmically transformed. The results are given as geometric means with 95% confidence intervals. We used the t test for independent samples to compare the groups. To control for differences in the age distribution, we analysed the logarithmic transformed variables using analysis of covariance, in which we included age as a continuous covariate. We then transformed the age adjusted means and confidence intervals back to the original scales. Treatment differences are given as the geometric mean of the ratio (Lactobacillus:control) with 95% confidence intervals. We used Kaplan-Meier survival curves for the time without respiratory symptoms or diarrhoea and the log rank test to compare the groups. We calculated medians with 95% confidence intervals to describe the time without symptoms. Cox's regression analyses were performed to adjust for confounding factors (such as age). In these analyses we treated values that were missing because of premature withdrawal as censored observations. The number of upper respiratory infections with complications, lower respiratory infections, and antibiotic treatments were dichotomised (none/one or more) and analysed with the χ2 test or Fisher's exact test. We used logistic regression analyses to control for age. Partial correlations were calculated between milk consumption and the numbers of days with illness, adjusted for age. All analyses were based on the intention to treat population. Statistical analyses were performed with SPSS (release 9.0). Of the 594 children randomised, 571 started the study, receiving either milk containing Lactobacillus GG (n=282) or control milk (n=289) (figure 1). Fifty eight children did not complete the follow up period. Table 1 details characteristics of the children before treatment. The block randomisation resulted in a similar distribution of children in the age groups under 3 years and 3 years and over: 51 (18%) and 231 (82%) in the Lactobacillus group and 55 (19%) and 234 (81%) in the control group. Detailed analysis of age distribution, however, showed that there were differences between the groups. Also, there were more children in the control group who had had five or more respiratory infections during the preceding 12 months. Age and preceding infections both have an effect on the incidence of infections and as they were strongly correlated we adjusted only for age in comparisons of treatment. Symptoms of illness as reported by parents—There were no significant differences between the groups in the number of days with respiratory and gastrointestinal symptoms (table 2). However, in the Lactobacillus group there were fewer days of absence because of illness—a Lactobacillus:control ratio of 0.85 (95% confidence interval 0.73 to 0.98)—and thus a reduction of 15%. The time without respiratory symptoms was significantly longer in the Lactobacillus group compared with the control group (5 (4.1 to 5.9) v 4 (3.5 to 4.6) weeks, P=0.03, fig 2). 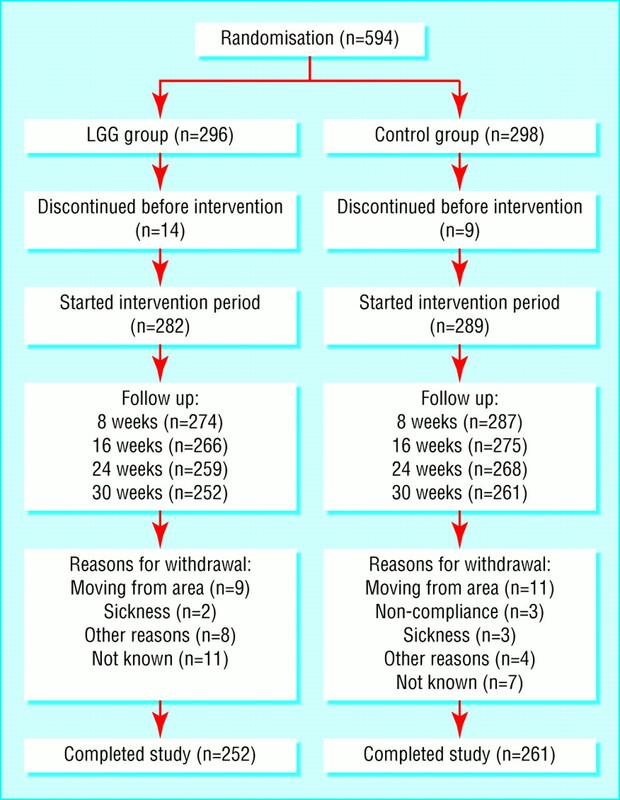 Time without diarrhoea was not significantly different (25 (24 to 26) v 24 (23 to 25) weeks, respectively, P=0.20, fig 2). Upper and lower respiratory tract infections diagnosed by doctor—The number of children with respiratory infections (otitis media, sinusitis, bronchitis, and pneumonia) was significantly lower in the Lactobacillus group (relative reduction 17%, table 3). There were also fewer children in the Lactobacillus group who were prescribed antibiotics for respiratory infections (relative reduction 19%, table 3). Age adjusted results—Adjustment for age reduced the difference between the groups in the number of days of absence (table 2). After age adjustment the odds ratio for the Lactobacillus group was 0.89 (0.77 to 1.02). The time without respiratory symptoms was not significantly different between the groups (data not shown), but for the Lactobacillus group the estimated odds ratio was 0.86 (0.70 to 1.06, P=0.16), indicating reduced risk. Time without diarrhoea was also not significantly different between the groups, but the odds ratio for the Lactobacillus group was 0.87 (0.64 to 1.28, P=0.36). The numbers of children with respiratory tract infections diagnosed by a doctor and being given antibiotic treatments for these were not significantly different between the groups (table 3). However, the age adjusted odds ratios for the Lactobacillus group were 0.75 (0.52 to 1.09, P=0.13) for all respiratory infections and 0.72 (0.50 to 1.03, P=0.08) for antibiotic treatment for respiratory infection. After age adjustment there was a negative but non-significant correlation between the amount of milk consumed and the total number of days of illness (r=−0.12; P=0.07) and days with respiratory symptoms (r=−0.11; P=0.09). The negative correlation between the amount of Lactobacillus milk consumed and days with gastrointestinal symptoms was significant (r=−0.17; P=0.007). Mean daily milk consumption was 260 ml in both groups (range 110-520 ml in the Lactobacillus and 100-600 ml in the control group). This quantity of milk contained 1-2x108 cfu of Lactobacillus GG. Compliance was also measured by the faecal recovery of Lactobacillus. Initially 12% of children in the Lactobacillus group and 4% in the control group carried Lactobacillus GG-type bacteria (P=0.29). Recovery figures were 97% v 9% (P<0.0001), respectively, in the middle of the study and 91% v 15% (P<0.0001) at the end. The median faecal Lactobacillus GG count in the Lactobacillus group was 5-8x104 cfu/g. The responses to the questionnaire at the end of the study were similar in both groups. Neither Lactobacillus nor the control milk affected stool frequency or consistency. There was no difference between the groups in abdominal pain or allergic symptoms and no apparent side effects. This randomised, double blind, placebo controlled study is the first to examine the long term effects of probiotic bacteria on infections in normally healthy children. The intervention lasted seven months during the season in which the infection rate is usually highest.18 Fewer children in the group taking Lactobacillus GG suffered from respiratory infections with complications, though there was no significant difference between the groups in the number of days with symptoms. We found a reduction of 21% in the occurrence of acute otitis media in the Lactobacillus group, although the difference between the groups was not significant. Complications from respiratory infections were the main indication (85%) for the use of antibiotics. Consuming Lactobacillus GG reduced such treatments. Children receiving Lactobacillus had fewer days of absence from day care because of illness, suggesting that Lactobacillus GG may lessen the severity of respiratory infections. It is well known that age is strongly associated with the incidence of infection.19 We noticed that despite the age stratified randomisation, there were differences in the age distributions between the study groups. Although neither the mean age nor the distribution between those aged under 3 and 3 years and over differed between the groups, there were more 3 and 5 year olds in the control group and more 4 and 6 year olds in the Lactobacillus group. Because of this unintentional distribution we adjusted the analyses for age, which reduced the differences between the groups. However, the results came close to conventional significance, and the differences were consistently in favour of the Lactobacillus GG group. Lactobacillus GG may influence the incidence of infections by stimulating non-specific immunity or enhancing humoral and cellular immunity.20 This immunostimulatory effect of bacteria has previously been shown to prevent recurrent infections in children attending day care centres.21 Our finding of negative correlation between the days with gastrointestinal symptoms and the dose of Lactobacillus milk consumed may indicate a dose dependent response. The compliance in our study was good, as measured by milk consumption, number of drop outs, and faecal recovery of Lactobacillus GG (most of the children in the Lactobacillus group carried Lactobacillus GG). Because Lactobacillus GG products are widely consumed in Finland, the children in the control group may unwittingly have consumed Lactobacillus during the study. At the end of the study, Lactobacillus GG-like bacteria were found in 15% of the children in the control group, which could have reduced the actual differences between the groups. Respiratory infections in children have a major impact on families and on society in general. In 1985 and 1986, the annual cost to society in general due to illness in children attending Finnish day care centres was about £650 to £2300 per child, depending on age.8 Thus a 10-20% reduction in the incidence of infections and absences from day care centres, which our results indicate is possible, could have important clinical, public health, and economic consequences. Alternative programmes for preventing respiratory tract infections in children are much needed. The administration of probiotic milk products is an easy and acceptable method, with no adverse effects. Our results show that probiotic milk containing Lactobacillus GG may reduce respiratory infections and their complications among children attending day care centres. We thank research assistant Ms Anne Nyberg for arranging the intervention and creating the database; Ms Mimi Ponsonby for language editing; and the Social Department of Helsinki City, the day care centre staff, the children, and their parents for making this study possible. Contributors: KH designed the protocol and the questionnaires, participated in the creation of the database, and wrote the paper. ES supervised the study and revised the manuscript. TP was responsible for the data analysis and wrote the sections on statistical methods. AP, JHM, and LN participated in the planning of the study and revised the manuscript. RK and MS initiated the study, participated in the planning, were responsible for the management of the study, and revised the manuscript. KH and RK are the guarantors of the paper. Funding Valio Research and Development, Helsinki, Finland. The University of Helsinki and the City of Helsinki participated in the funding by providing supervision and technical help. Competing interests KH has been employed by Valio Research Centre for two of the past five years. MS and RK are employed by Valio Research Centre. ES has given two educational presentations on Lactobacillus GG for Valio, and TP has received consulting fees from Valio.
. Frequency and severity of infections in day care: three-year follow-up. J Pediatr 1991; 118: 509–514.
. Risk of infectious diseases in children attending different types of day-care setting. Respiration 1994; 61(suppl 1): 16–19.
. Form of day care and respiratory infections among Finnish children. Am J Public Health 1995; 85: 1109–1112.
. Infection control challenges in child-care centers. Infect Dis Clin North Am 1997; 11: 347–365.
. Day-care centers and diarrhea: a public health perspective. J Pediatr 1997; 131: 476–479.
. Day care centers and respiratory health. Pediatrics 1999; 103: 753–758.
. Illness associated with child day care: a study of incidence and cost. Am J Public Health 1989; 79: 479–484.
. Infections and other illnesses of children in day-care centers in Helsinki. II: the economic losses. Infection 1991; 19: 331–335.
. Estimation of direct and indirect costs because of common infections in toddlers attending day care centers. Pediatrics 1999; 103: 556–564.
. Lactobacillus GG—a human probiotic strain with thorough clinical documentation. Food Rev Int 1997; 13: 293–313.
. Enhancement of the circulating antibody secreting cell response in human diarrhea by a human lactobacillus strain. Pediatr Res 1992; 32: 141–144.
. Probiotic bacteria down-regulate the milk-induced inflammatory response in milk-hypersensitive subjects but have an immunostimulatory effect in healthy subjects. Clin Exp Allergy 1998; 28: 1474–1479.
. Prophylactic Lactobacillus GG reduces antibiotic-associated diarrhea in children with respiratory infections: a randomized study. Pediatrics 1999; 104: e64.
. Lactobacillus GG in the prevention of antibiotic-associated diarrhea in children. J Pediatr 1999; 135: 564–568.
. Effect of lactobacillus GG yoghurt in prevention of antibiotic associated diarrhoea. Ann Med 1990; 22: 57–59.
. Comparison of ribotyping, randomly amplified polymorphic DNA analyses, and pulsed-field gel electrophoresis in typing of Lactobacillus rhamnosus and L casei strains. Appl Environ Microbiol 1999; 65: 3908–3914.
. Lasten sairastavuus päiväkodeissa ja ryhmäperhepäiväkodeissa. Suomen Lääkärilehti 1994; 49: 3579–3583.
. Absences for sickness among children in day care. Acta Pædiatr 1992; 81: 929–932.
. Infections and other illnesses of children in day-care centers in Helsinki. I: Incidences and effects of home and day-care center variables. Infection 1991; 19: 230–236.
. Probiotic immunomodulation in health and disease. J Nutr 2000; 130: 403–49S.
. Stimulation of nonspecific immunity to reduce the risk of recurrent infections in children attending day-care centers. Pediatr Infect Dis J 1993; 12: 648–652.